We have returned with a trio of tales featuring the Man of Night, STARMAN!! On the agenda- Adventure Comics 67-69. In this round, Starman meets his arch nemesis, The Mist in an adventure beneath the Earth's surface. Beware the giant cannibal vampire bats, and Doris. Then, Alfred Bester gives us a tale of Starman fighting forest fires, and a group headed by somebody who may be very close to Ted Knight. And, finally, Starman steps up to stop a threat to the safety of the Gotham docks, and learns to develop an inner Admiral Ackbar. Yes, we are aware that the holidays, and real-life have thrown off our release schedule, but a new episode has been recorded, and is on the editing block. We will resume our regular release schedule of new episodes on the last Thursday of the month with episode 3, which will be hitting iTunes and the RSS feed on 01/30/2014, and then every month throughout 2014. We are sorry for the massive delay, and we are excited to get back to the show. Prepare to hoist your gravity rod in the air, and set off for more adventures with Ted Knight, the original Starman, in a trio of all new tales. Charlie Niemeyer, Jon M Wilson, and J David Weter open up Adventure Comics 64-66 to look at a horror-themed story of zombie-like soldiers, an undersea pirate adventure, and then a tale of a camera infused with voodoo magic. Fists will fly, and evil will fall in the second episode of The Starman Observatory. 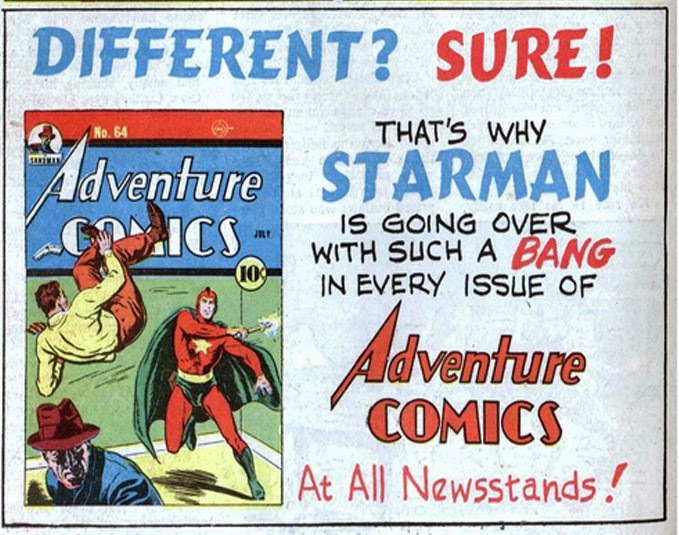 It's here, the first episode of The Starman Observatory, the podcast that looks at the golden age adventures of Starman. Hosts Jon M Wilson, Charlie Niemeyer, and J David Weter crack out their gravity rods, and head off for high adventure. From mountain fortresses, to flying ships, all the way to hidden savage lands, Ted Knight forges a path of adventure, perfectly suited for Adventure Comics. This time around- Adventure Comics issues 61-63. The promo is here. Share it in your own podcast, or on you social networking sites. Tell everyone you know that Starman is coming, and he's bringing Jon M Wilson, Charlie Niemeyer, and J David Weter with him. 9/26 is the date, mark it down, and prepare for a new episode on the last Thursday of every month. 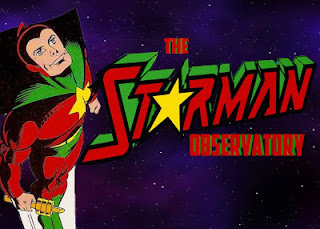 The Starman Observatory will be a 14-episode podcast mini-series that looks at the Golden Age adventures of the original Starman- Ted Knight. Join Jon M Wilson, Charlie Niemeyer, and J David Weter as they plunge into the pages of 42 tales of high adventure from the pen of Jack Burnely. With a new installment released on the final Thursday of every month, this show will give fans of the Golden Age a new treat every month. Join us as we see the Man of Night face off against Dr. Doog, The Light, The Mist, and more. The first episode is coming on September 26th, 2013 on iTunes, and other podcatchers. 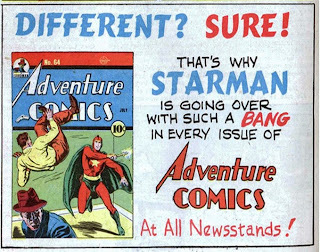 The Starman Observatory is a limited run 14-episode Podcast covering the solo appearances of Starman in the pages of Adventure Comics. Hosts Charlie Niemeyer, J David Weter, and Jon M Wilson read, and discuss these Golden Age Comics, with new episodes released on the last Thursday of every month.